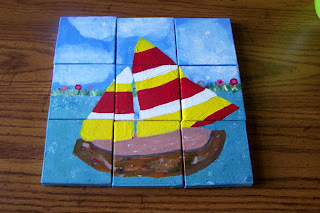 This kept Annie busy for hours. 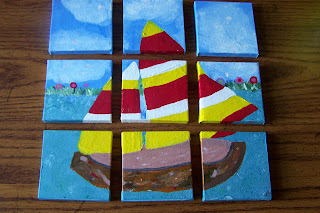 She painted tiles, purchased from JoAnn, with acrylic paints. We plan to hang them separated for a mod look. What a great idea! I’ll have to suggest a project like that for my boys… I can imagine that they would enjoy it! We spent tonight in the basement due to tornado sirens going off. Crazy night! That looks like a fun project! I think I would like to try that. They look good “mod”.